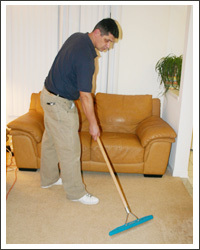 Carpets are pre-vacuumed to remove the approximately 80% of soils that are dry in nature. 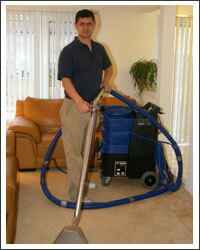 Things like hair, pet dander, skin & dust will not dissolve in cleaning & must be removed first. Carpets are then pre-sprayed using a product that effectively breaks down & loosens the oil-based soils that make up the remaining 20% of carpet residues. Next, the carpet is "flushed" to remove the loosened soils. This process is commonly referred to as "Hot Water Extraction" as an extremely hot solution is used to penetrate the carpet fibres. 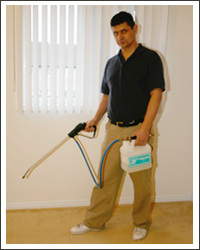 The solution & the soils are then simultaneously removed using powerful vacuums. The application of a "Textile Rinse" neutralizes any remaining chemical residues & leaves the carpet fibres soft & the dyes vibrant. Final grooming of the carpet allows good air-flow, improves appearance & speed up drying time.